With any surgery, there can be some discomfort. 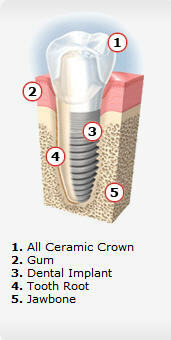 Placing one implant normally causes less discomfort then placing several. Anesthesia is administered to help reduce any discomfort during the dental implant process. Most patients report that they were much more comfortable following the procedure than they had anticipated. Your doctor will prescribe medications to ease any discomfort that may occur. Ask your dentist to recommend another patient who has already had tooth replacement therapy to assess their personal experience. Once the implant crowns and abutments are placed you will recieve a perscription mouth rinse to use around your implants twice a day. Your new teeth must be cared for and checked regularly, just like your natural teeth. Brush and floss as recommended by your dentist or dental hygienist. See your dentist in six months, or more frequently if so advised. Boulder Dental Implants - Anyone who is missing one or more teeth due to injury, disease or tooth decay may be a candidate for dental implants. The dental implant is stable and comfortable. No adjustment is needed after placement. Normally, it will serve its owner for life.